Considering watching 209 a third time and drinking every time Cersei drinks. I loved this change from the books. I loved how the helm had the antlers too. And the first time I read it I was confused as to who it was. I think it will help the non book readers understand it a bit better and hopefully later we'll get the "when the sun is gone no candle can replace it" line. It's one of my favorites. I for one am glad he's keeping his nose. CGI budget would have been wasted on a Voldemort-esque transformation in my opinion. The Rains of Castamere is now on repeat until I get tired of it. One of the best episodes so far. It was magnificent. 10/10. I got chills multiple times. Of course it wasn't exactly how I pictured it but it was still wonderful and completely blew me out of the blackwater. Cersei should just be drunk all the time and the scene with Tommen at the end was so powerful. 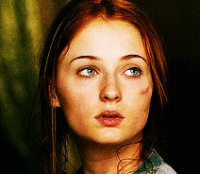 Sansa was so flawless it hurt. Overall one of the best episodes yet. I can't wait until next week.